The Blue Shark is generally found in deep and cool waters as it is an epipelagic species. They have sleek, tapered body specifically made for agile, graceful movements through the water. They have a long conical snout combined with extremely long pectoral fins. Their skin color ranges from a distinct deep blue on top, to bright-blue sides and a crisp white underbelly. These sharks were originally named Prionace glauca by naturalist Carl Linnaeus in 1758. It is one of the most over fished sharks in the world. Blue Shark belongs to the family ‘Carcharhinidae’ and the genus ‘Prionace’. These sharks usually grow to a length of 13 feet and up to 450 pounds. They have electroreceptors concentrated in their heads which help them sense the heartbeat of another fish from miles away. Most Blue Sharks survive for less than a month in captivity. Although their average lifespan in the wild is 20 years. They are sometimes referred to as the wolves of the sea because they are often seen in groups. Their groups are known as a School. These groups show a distinct hierarchy. Human beings are the main predator of these sharks. The upper teeth of these sharks are triangular in shape, serrated, and recurved. Males reach maturity by four or five years of age, while females at five to six years of age. Their diet comprises of bony fish, smaller sharks, sea birds, shrimp, and lobster but they prefer to eat squid. Declan, Tobin. " 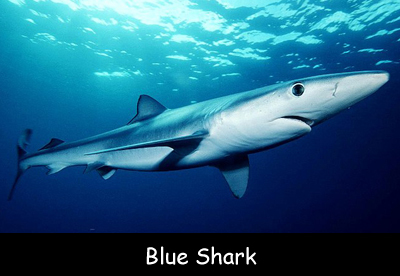 Blue Shark Facts for Kids ." Easy Science for Kids, Apr 2019. Web. 21 Apr 2019. < https://easyscienceforkids.com/blue-shark/ >.